Kale and Quinoa Salad with Pomegranates and a Champagne Vinaigrette is one of my families favorite salads! Full of flavor and super healthy! Great for lunch or a meatless dinner! Quinoa adds a ton of protein. Topped with the superfood kale and the dressing has tahini and lemon….delicious!#gluten-free #low-carb #vegetarian. I have been Blessed to have my younger son home for a bit. Yesterday, he had to go back to California! I miss him more than anything and he’s my go for recipe ideas and he’s a foodie, so he is my taste tester. I had to share this Kale and Quinoa Salad with Pomegranates today because it’s one of his favorite salads! I have been making this recipe for quite some time and I use Champagne Vinaigrette Dressing! Oh,you have to make this salad dressing with this salad and anything else you want to be delicious! This and my Superfood Detox Salad are his two favorite salads! Quinoa is filled with protein. Perfect meal plan addition. Make a large batch on Sunday and add to salads all week. Have a mitochondrial disease like myself, quinoa has magnesium which protects red blood cells and a filled with antioxidants. I suggest making this as a meal prep salad. This keeps very well in fridge. The key to kale, not sure why that makes me giggle, and salad for me is to put the dressing on the kale and let it marinate the kale for a little while. The marinade softens the kale so it is tender and yummy. Pomegranates are low-fat, high in fiber, an anti-inflammatory, and can help lower blood pressure. This is a perfect healthy meal this is both filling and delicious. I gauge by the hubs, he’s all about healthy food for dinner and then hits the freezer for a scoop of ice cream if he really is not full. This one satiates and the hubs never needs that sweet treat after this meal! I hope you enjoy this salad as much as my family! Any comments or questions about the recipe, leave them below! It would be awesome if you liked the recipe to give it a rating! 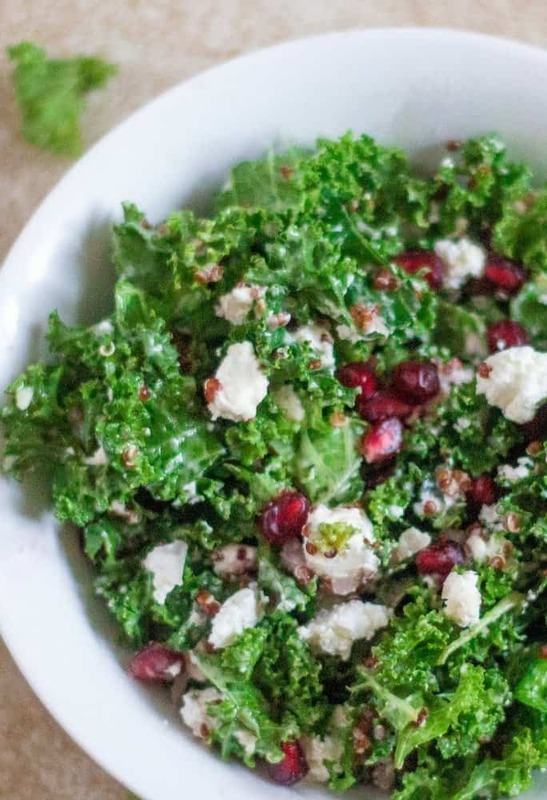 A tasty and healthy salad loaded with kale and quinoa. Easy and quick to prepare and adding in pomegranates and goat cheese makes this a balanced meal! I top this salad with a champagne vinaigrette. Pour quinoa into a strainer, rinse quinoa well. Cook quinoa according to the package. To a blender, add diced shallots, minced garlic , dijon mustard, champagne vinegar, agave, pepper, and salt. Blend well until smooth. Slowly stream in the avocado oil into the blender to emulsify the salad dressing, Set aside. 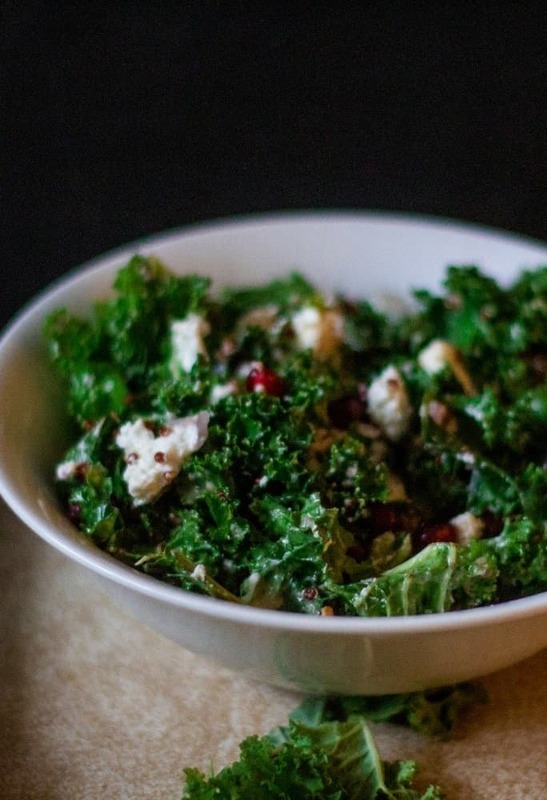 In a large salad bowl combine kale and shallots. Drizzle some of the Champagne Vinaigrette over the greens. Massage the vinaigrette into the greens to soften the kale. 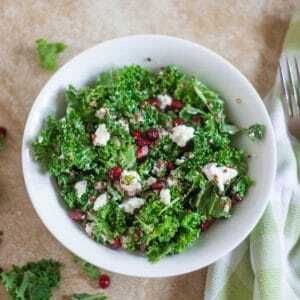 To the bowl of kale, add the quinoa, pomegranate arils, and crumbled goat cheese. Drizzle some more of the champagne vinaigrette on the salad. Toss well and serve. Great salad for the new year !! tried the recipe and I make it everyday now for lunch! Thank you Mairead! I am so glad you are loving the salad! It’s super-hot in Australia right now and I been on the hunt for a lite, healthy and nutritious meal Thanks for the share Eileen! This looks so delicious and refreshing! I cannot wait to make it this week! Oh my gosh this looks delicious!! I have never had kale, though. I should try it to be healthier! Yum, this sounds delicious. I have been eating a lot of pomegranates lately, they are so yummy and packed full of goodness! I do the same thing as you with my quinoa – cook a big batch on the weekend and then throw it into salads throughout the week – easy! Oh it is fabulous to make a big batch of quinoa. Pomegranates are so delish! hahah the key to kale! Yes it needs ‘massaging’ in a dressing, lemon juice works great too! Love quinoa! I do the same thing too, batch cook it (I use the rice cooker) and then keep in the fridge. Thank you Di 🙂 ! Love lemon with kale as well! I still need to try quinoa but I do enjoy kale! This might be the perfect recipe to try out quinoa! I hope you do, quinoa is really tasty and so versatile! This looks amazing! I love the addition of the pomegranates! This is such a beautiful AND healthy salad. Oh my YUM! Thank you Jaime. I appreciate the kind words, and it is a yummy salad! Omg this looks so yummy!!! I’m always looking for new kale recipes. So going to give this a try! Thank you Courtney, I love this salad as well! Believe it or not, I’ve never had kale or quinoa. I could try them both at once with this recipe. What a healthy salad! I hope you do – this one is delish! This looks so delicious! I’ve never had a kale salad but I think it’s time for me to take the plunge. I hope you do – its fantastic! That salad looks delicious. Quinoa is a healthier alternative to carbs. Looks so yummy! And I’m with you on the flu shot, I always get sick when I get the flu shot. 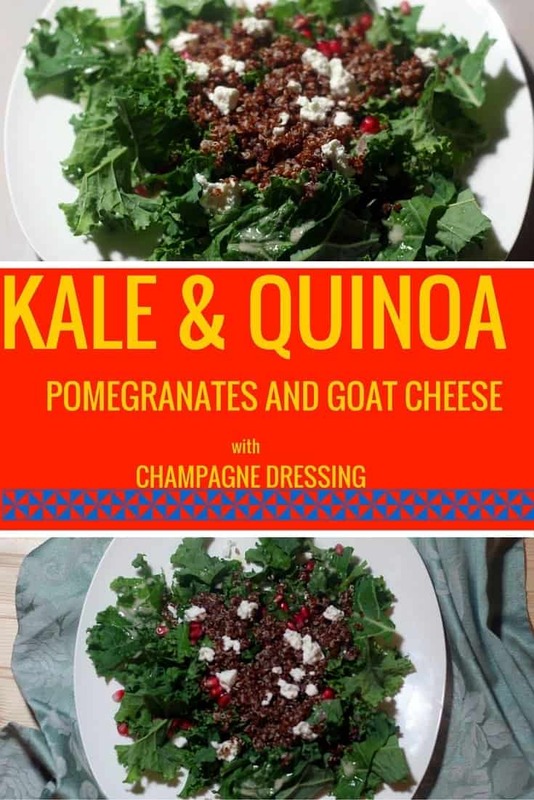 I’ve never tried Kale or Quinoa, but this salad looks delicious! This looks delicious and I know it is very healthy! This looks so good. I love kale and the tartness of the pomegranate seeds. The addition of quinoa sounds perfect to make this a more filling salad. Great recipe. Always love seeing a new and creative recipe. I’ve always been curious of pomegranates in dishes because each morsel has a seed in it… Does this add a crunch? So curious I don’t want to keep missing out on this type of ingredients if it has a amazing crunch! It is a juicy seed so it adds not only crunch but a great burst of a sweet flavor. In a salad, it really balancing the acid in sald dressings. I hope you give it a try. This looks good. I bet the pomegranate add a nice flavor. I could eat pomegranate in almost anything – it really is delish! Omg this salad sounds amazing!!!! I just love kale anything. Yum! A very delicious looking salad. I haven’t tried the Quinoa yet but I heard it is good for you. However I love salad any green or orange color plus fruit is heaven to me. This looks delicious and really healthy. I would love to try it. I haven’t tried quinoa, yet. The salad looks delicious. I hope I can find Quinoa here. I hope you find it – or you might trying ordering quinoa on-line, its so good! Wow this is such a yummy recipe! Sounds really healthy too. That looks yummy and refreshing. I love kale! I love the whole kale and quinoa combo! I haven’t tried it with pomegranate yet though. Looks like a tasty recipe, will have to give it a go! YUM! I love pomegranates and kale. sounds so good. This recipe is right up my alley. 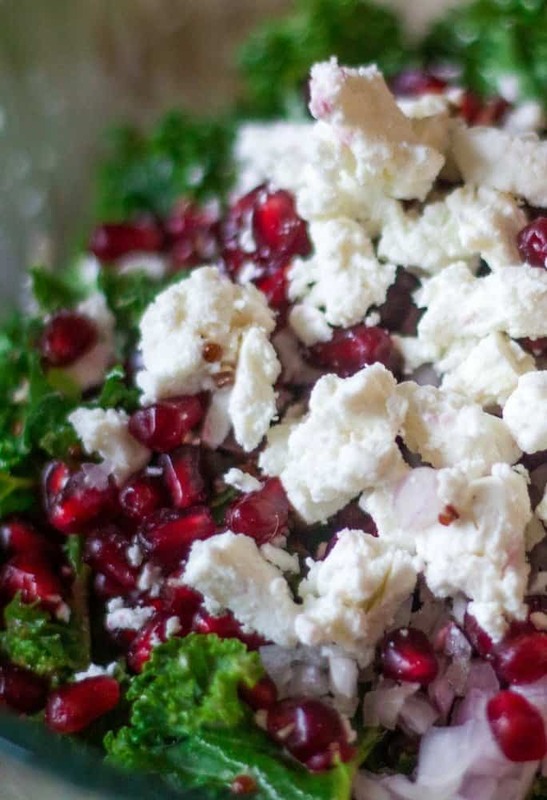 Pomegranates and goat cheese are such a delightful combo! The vinaigrette sounds good enough to use on almost any salad. Making a note of it! I am not a very courageous eater so I haven’t had kale yet. I need to try though. This sounds good. Oh give it a try, ad definetley let the kale sit in the vinaigrette for a bit, I hope you give it a try, this is really yummy! I have never had a salad like this but it sounds really good. I bet the texture is amazing. I just love the pomegranate in this salad. This is a must make for me, maybe even over the weekend! This salad is filled with ingredients that I love – can’t wait to try it! Looks awesome as usual but you would have to force feed me this one as kale is not on my very short list of veggies! Claudette, you are so funny – try spinach or arugala! That looks great! Never would have thought to combine quinoa with pomegranate! Krystal – It is a great combonation – I hope you try it! What in interesting combo! I’m not crazy about kale whole but I juice it a lot! Thanks for the recipe. I have been trying to get into the healthy lifestyle, not only for myself but for my family as well. I have heard about all the healthy benefits of kale, and I love goat cheese, so this recipe is a must try for me. This sounds like a lovely salad. I can’t wait to try it. This looks delicious and so healthy too thank you for sharing this recipe with us can’t wait to try it! I think quinoa is an awesome alternative for ingredients that would add carbs to your diet. It’s healthy, it has a lot of benefits and it absorbs flavor really well! I couldn not agree more Elizabeth – quinoa is on the top of my list! I’ve never tried it, but it looks delicious, I wanna try it. I hope you try it. The texture is amazing and filling and the big win low-fat. That salad sounds yummy. I love Kale! I’m going to try your recipe. I have never tried a salad with kale. I use my kale in smoothies. I bet if you like kale in your smoothies – you will love this salad – great tasting! Thank you Dana – I really find it to be so tasty! Now that is a salad! Mine never look that good. Thank you Chastity, I hope you give this one a try! It is really tasty!